Messhoff's Flywrench has been around, in one form or another, since 2007, meaning it is basically prehistoric in indie terms. The Nidhogg developer successfully crowdfunded an embiggened version back in 2009, but until now things on the Flywrench front have been worryingly quiet (not least for the people that funded it, and assumed it abandoned). Well, surprise: the well-hard arcade-puzzler about a transforming bird-spaceship is out soon. It's coming to Steam in a month, and we have a new trailer showing off its evolved form. 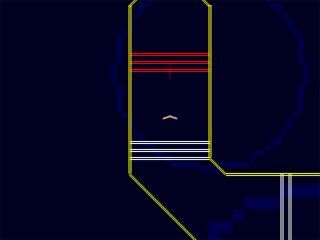 "Flywrench is a game about piloting an abstract morphing bird-spaceship through a complex web of colored lines. Each maneuver that Flywrench performs, such as flapping like a bird, or tumbling like a baton, changes its color. Match the ship's color with a shape's to pass through it, hit an obstacle as the wrong color and fail. The pace is unrelenting and in a blink the challenge resets without penalty. Flywrench is accompanied by an electronic music soundtrack curated by the world famous, Daedelus." I don't know who the world famous Deadelus is, but they've curated a pretty nice electronic soundtrack. This new version of Flywrench features a level editor, and lots and lots of levels of its own. We gave Messhoff's Nidhogg 93%, so there's reason to be excited about this new release.